This is the second or third year in a row that that our intrepid photographer, Ned Price, has been at the 7.9 mile mark at Boston to take pictures of the leaders. Here they are. Ned lives near the course and got himself there without running up his expense account. You may recall Ned's work from last year and his historical photos from the U.S. Poland dual meeting in Chicago about 1962. US Poland Dual Meet click here. Lelisa and Cherono 19 miles away from that incredible finish. in 2hr. 15min. 29 sec. Worknesh Degefa (1st) breaking away from the pack. Nothing ventured, nothing gained. Two news stories have come in recently, and I've been able to pull it together once again to get them out to all of you. The first story comes from Gary Corbitt reminding us of Oscar Moore and his wonderful career. 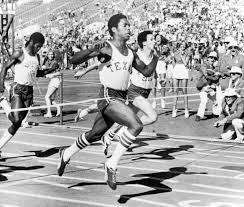 The second story details the passing of Johnny "Lam" Jones, one of the great line of Texas sprinters. Happy 81st Birthday (March 31) & Congratulations! 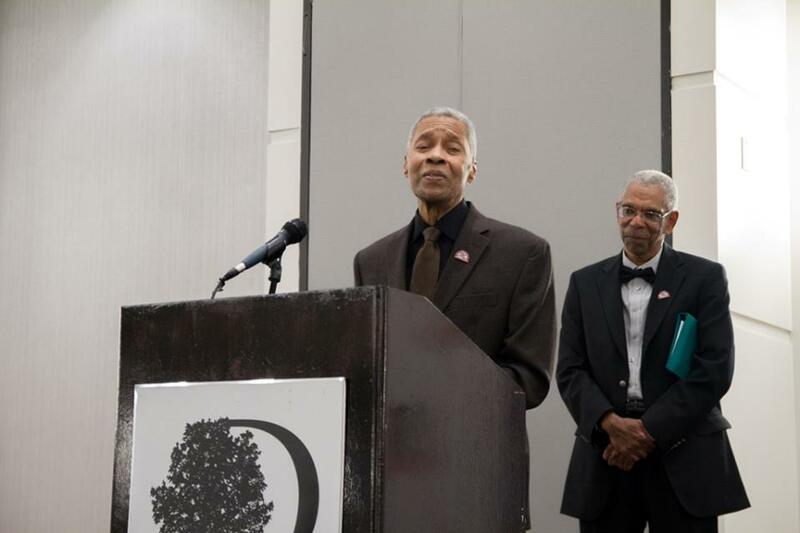 into the National Black Distance Running Hall of Fame. Attached I’m pictured with Oscar as he gives his acceptance speech. McKenzie dominate the New York running scene. 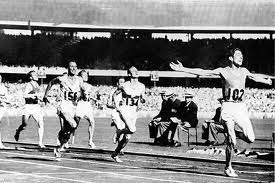 Seeing Oscar’s running form was akin to watching a dancer gliding majestically across a stage – Speed & Grace. 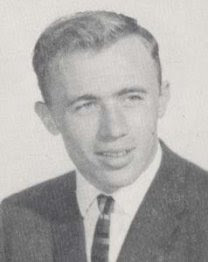 September 15, 1963 – Oscar Moore defeated Pete McArdle in the NY Metropolitan AAU 20K Championship. 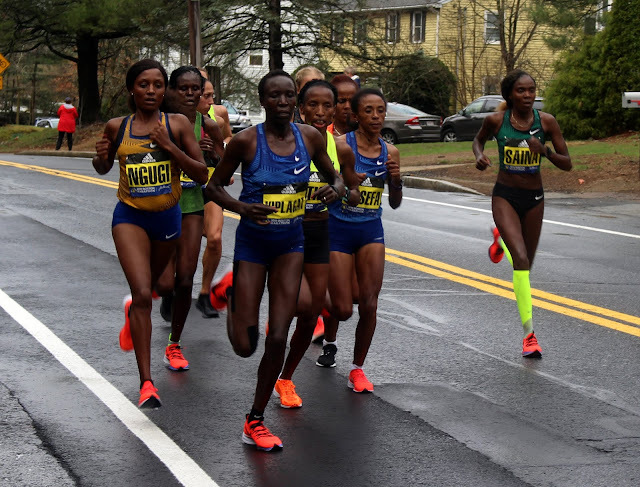 This was perhaps the greatest road race in New York City history. Oscar led the entire way in a neck and neck battle. He pulled away in the last lap to win by a mere 11 seconds. It was McArdle’s first defeat in the New York area in 4 years. Oscar set 4 course records during this race on the Macombs Dam Course in the Bronx at Yankee Stadium. 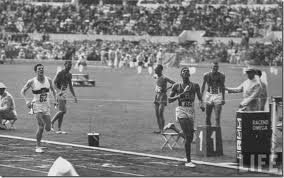 October 16, 1964 – Oscar Moore becomes the first African American to represent the U.S. at the Olympic Games for the 5,000 meters. 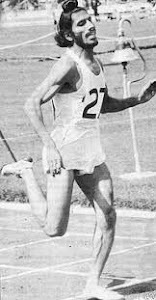 November 1, 1964 – Oscar Moore sets the 5 mile cross-country record of 24:41 at Van Cortlandt Park. 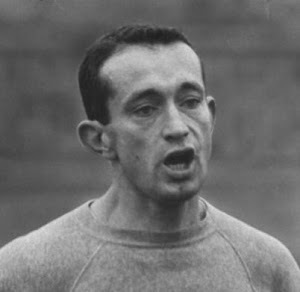 November 15, 1964 – Oscar Moore set the 6 mile cross-country record of 30:09.9 at Van Cortlandt Park. 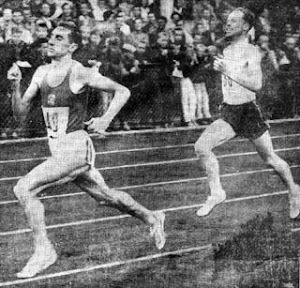 The previous mark of 30:34.6 was set by Pete McArdle in 1963. 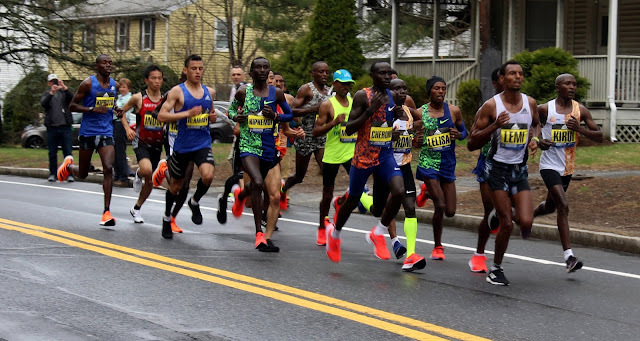 This was a 6 mile handicap race put on the Road Runners Club: New York Association. November 30, 1964 – Oscar Moore won the 7th Annual RRC: NY Association 9 Mile cross-country race. 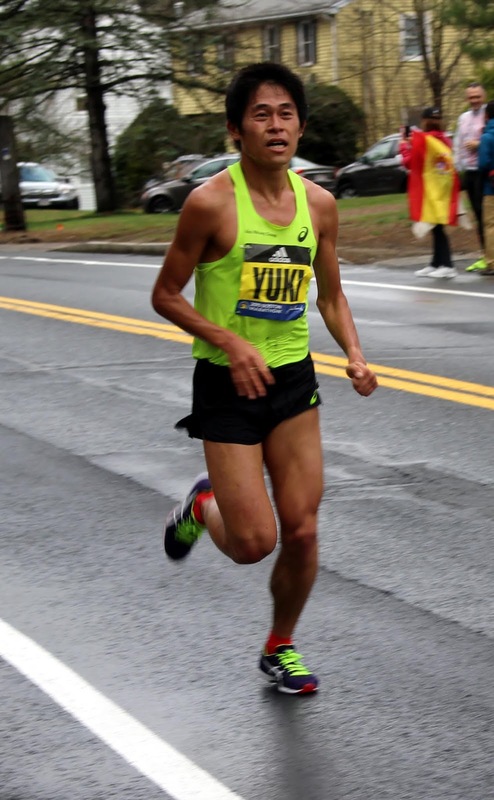 He lowered his Van Cortlandt Park course recorded to 46:19.6. His 3 mile and 6 mile spits were 15:07 and 30:45. 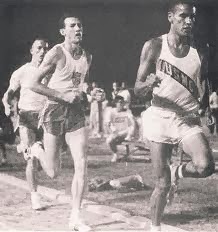 March 4, 1967 – Tracy Smith sets a world indoor record for 3 miles of 13:16.2 winning over Oscar Moore. Oscar set the pace for most of the race and recorded a collegiate record of 13:22.2. 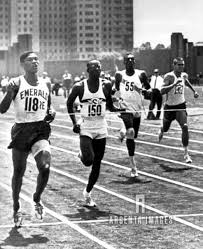 The race was the AAU National Championship in Oakland, CA. 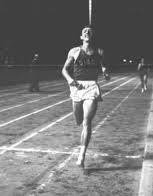 Oscar Moore recorded victories over these great runners: Jim Ryun, Jim Beatty, Billy Mills, John Lawson, Conrad Nightingale, and Ron Larrieu. He also had some close races with Gerry Lindgren. 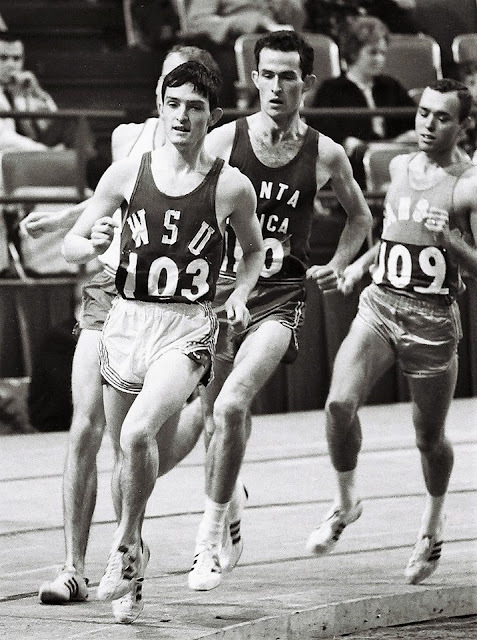 Oscar holds the Southern Illinois University 5,000 meter record both indoors and out. That’s 50 years holding these school records. 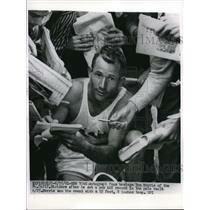 Oscar Moore was track & field and cross-country coach at Glassboro/Rowan University for 22 years 1971 to 1993. 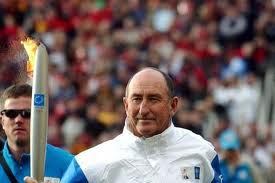 His successes as coach were rewarded with his 2009 induction into the U.S. Track & Field and Cross-Country Coaches Association (USTFCCCA) Hall of Fame. Oscar’s greatest gift is the impact he’s had on people through his years as a coach and his ministry that continues today as an ordained minister in Glassboro, New Jersey. 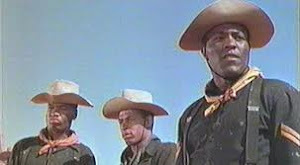 Johnny "Lam" Jones, a two sport All-American at the U. of Texas, passed away March 15, 2019, and left a legacy of promise, greatness, and disappointment. From Lampasas, Texas, he received the nickname "Lam" from U. of Texas football coach Darrell Royal who had two John Jones on his team. The other Jones from Hamlin, Texas got the nickname "Ham". 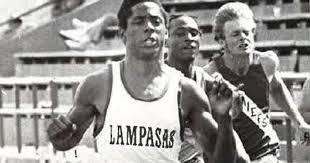 Johnny "Lam" Jones was an outstanding high school sprinter in 1976 making the US Olympic team with times of 9.21 for 100 yards and 10.14 in the metric distance. He finished sixth in the 100 meters at Montreal and ran the second leg of the gold medal 4x100 team. 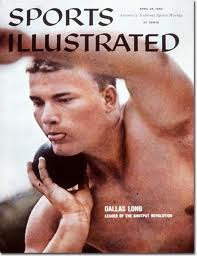 He would later donate his gold medal to Special Olympics, an organization he supported. 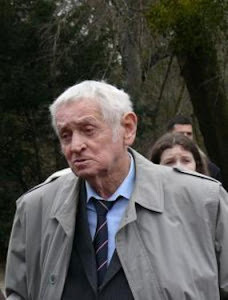 He died at the age of 60 with bone marrow cancer. He was was also the MVP of the U. of Texas football team and an All-American in that sport. Drafted after his senior year by the New York Jets, he was the first million dollar NFL draftee. But his career was injury filled and he was out of the game in five years. He had several legal issues after his NFL days but managed to turn his life around. For a detailed review of his life and his career, you can read the New York Times obituary by Frank Litsky and William McDonald. 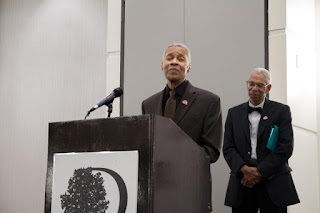 Here is the link to the New York Times obituary on Johnny 'Lam' Jones. I well remember Oscar Moore while he wasat S. Illinois. However, I had completely forgotten how he dominated the Cross Country Scene at Van Cortland Park! What an outstanding runner and gentleman! Last Fall while driving home from work, I stopped in a favorite second hand store in Parksville, BC on Vancouver Island to look through the used book section hoping I might find something to stimulate my interest. Nothing bore fruit in the book section, but on the way out I noticed some old medals resting in a display case, nothing track and field related, but there was a small plaque with some engraving and a runner in a sprint start. 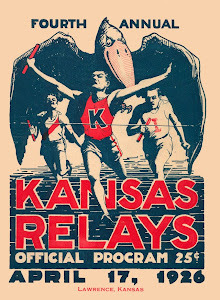 On it was inscribed, "British Games Inter County Athletics Championships 1951". Further inscription indicated the plaque was "presented by News of the World". At the bottom was an embossed logo CAU. I asked a clerk to take it out for more careful evaluation. Nothing more to be seen however, no name of an individual, no event , and no finishing place. Still I was intrigued and the price was right, $8.47 Canadian. How that price was derived is anyone's guess. Actually who won the plaque was anyone's guess. I didn't have a lot of knowledge of British track and field, but I knew a few blokes who do have a good background in the game. So I made the purchase and brought it home with me, set it on my desk and contemplated who might have earned that award 68 years ago. The cover of anodized brass was held onto a Bakelite backing with a single threaded screw and nut. It measured about 5 inches by 6 inches. Hoping there might be some clue behind the cover, I carefully removed the nut and lifted the plate off the backing. Was there perhaps a 20 Pound note hidden or even something more precious? Sorry to disappoint you, but there was nothing, so I reassembled the two plates and got on my computer to send an email to John Cobley who lives only a few hours away in Sydney. John is an English gentleman and scholar who might also be described in American vernacular as a track nut. He writes the running blog racingpast.ca as well as a jazz blog and translates Russian poetry. He came to the US as a runner and attended and ran for Brigham Young University and was for a semester, a teammate of Lasse Viren when Viren also attended BYU. 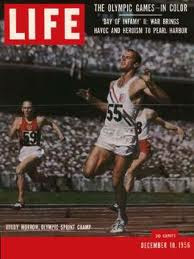 I also wrote to Tim Johnston who was 8th in the 1968 Mexico City Olympic Marathon and whom I've met through the blog. All he could say was, "George, you've got a treasure." He also explained that the All Counties was one of the top three meets each year in England. County Championships are organised by County Associations across England. You can compete at your County Championships if you were born in that county, have resided there for a specified amount of time or meet other conditions your county allows for. For many counties, the track and field championships provide opportunities for those athletes wanting to be selected for their county at the England Athletics AAA & UK CAU Senior Champs. I believe that the system and schedule are much different in modern times, but I noticed that The England Senior UK CAU Championships are July 27-28 this summer in Manchester, if you happen to be passing through. I thought John Cobley might be able to give me some ideas about the plaque. After all an Englishman should know something about the English All Counties Athletics Competition of 1951. He did know of the All Counties Athletics Championships, informing me that it was one of the early big meets each year in England. Each county in England is entitled to send one entry per event to that meet. So it is an important and fairly well contested meeting. But that's about all that John could tell me about the 1951 event. After I sent him a picture John decided to forward it to Bob Phillips in Australia. Bob is one of the foremost authorities on track and field in the Commonwealth. 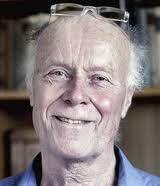 He once wrote for the publication Athletics Weekly which is the British equivalent of Track and Field News. 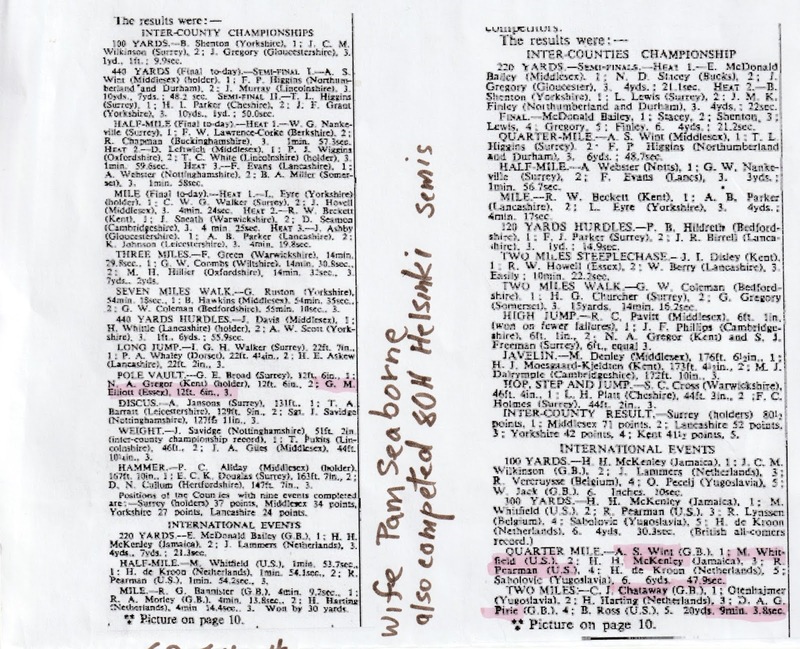 What came back from Bob Phillips was a copy of the meet results from The Times of May 14 and 15, 1951. 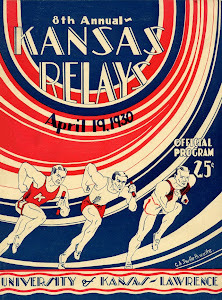 The only North Americans who appeared in the meet were Mal Whitfield and Reggie Pearman, neither of whom would have been known to have moved to Canada and carried the plaque across the Atlantic. But Bob displaying his incredible knowledge of the sport and the athletes went through the results and came up with a name, Geoff Elliott, one G.M. Elliott from Essex County placed second that day in the pole vault at 12' 6", same as the winner but with more misses. Bob also knew that Geoff Elliott did indeed move to Canada, and he strongly suspected that the plaque had belonged to Mr. Elliott. I also learned that "CAU" was the logo for 'Counties Athletics Union' the organizing body. FYI, Mal Whitfield won the half mile at the meet in 1:53.7 over De Kroon of the Netherlands in 1:54.1 and Reggie Pearman was 3rd in 1:54.2. 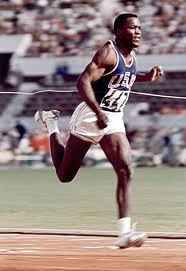 Mal also was 2nd in the quarter mile as they called it to Arthur Wint who ran 47.9. Oh yes, Whitfield also ran a third race finishing 2nd to Herb McKenley in the 300 yards in 30.3 a British All Comers Record. Further, one R.G. 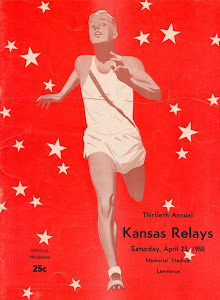 Bannister won the mile that day in 4:09.2 and C. Chataway took the 2 miles in 9:03.8. 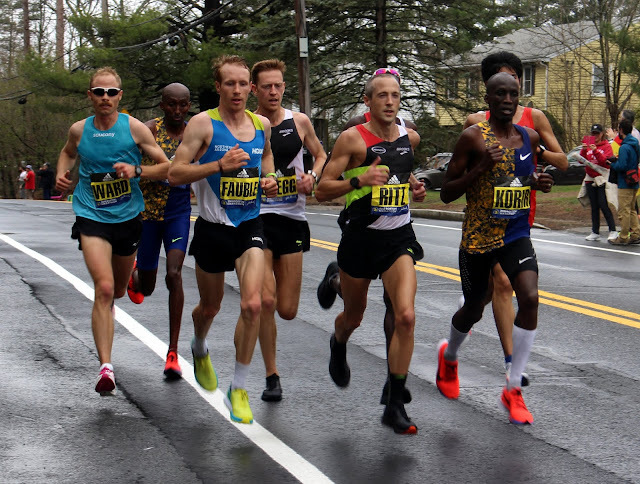 Of note, G. Ruston of Yorkshire County won the Seven Miles Walk in 54 minutes and 18 seconds in a nailbiter over B. Hawkins of Middlesex County who crossed the line 17 seconds later in 54 minutes and 35 seconds. 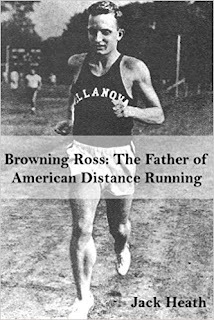 Note from Dennis Kavanaugh : It appears that Browning Ross, another American, also ran—the next to the last line in the right hand column. 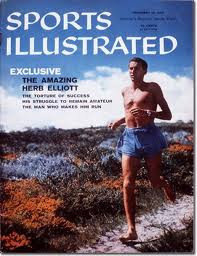 So what about this Geoff Elliott chap? Where do I find him or his heirs? That was the easy part. I had all of Canada at my door and Google at my fingertips. My effort, after about 10 seconds of work, led me to a speech made by Dr. Walter Herzog, founder of the Human Performance Lab at U. of Calgary, when he was presented with an award for his scholarly work in the field of sport. Dr. Herzog is on the faculty at the University of Calgary. In his speech, he mentioned his close professional association with Geoff Elliott, now passed away. I found Dr. Herzog's address and emailed him about Geoff and the award I had found. He referred me to an Elliott family friend who again informed me of Geoff's passing, but he also gave me the postal address of his widow Pamela and a daughter who lives with her. I wrote them and the daughter's sister, Yvonne Graf contacted me in late February. Yvonne told me that she was on a short visit to Nanaimo on Vancouver Island. I happened to be passing through Nanaimo the very next day and was able to return the plaque to her in person. Below you see the two of us, with Yvonne holding the long lost plaque. She couldn't figure out how it got to Parksville, because the family still had boxes full of Geoff's awards from years past. She thought that perhaps her father had leant some of the awards to a good friend and neighbor, and when that man passed away his family may have disposed of them including our now resurfaced plaque. That is the only explanation. George Brose and Yvonne Graf with the plaque. Czechoslovakia vs England Women 1954 clik here for Link to that meet. In this you will also see Diane Leather, first woman to break 5 minutes for the mile that year winning the 800 meters as well as Pamela Seaborne, Geoff Elliott's future wife, winning the hurdles. Pamela Seaborne: 8th overall in Helsinki 80m hurdles. Eliminated in semis when only six went to finals. 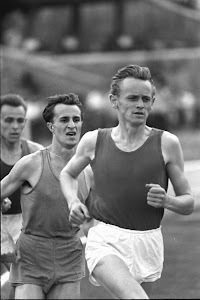 Soviet Union vs Czechoslovakia 1954 Slightly off subject but while downloading the England Czechoslovakia women's meet, I found this meet with a lot of footage of Vladmir Kuts defeating Emil Zatopek in a 10,000. 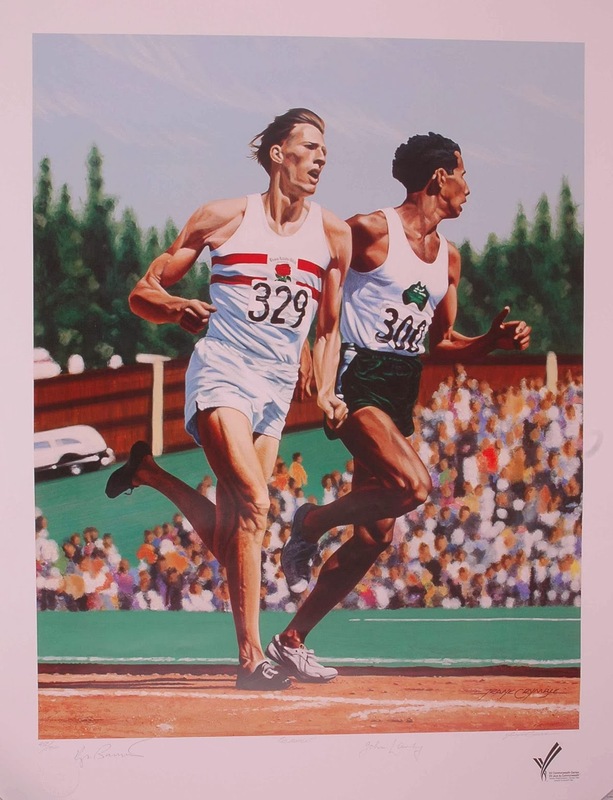 Zatopek was past his prime and Kuts was on the way up, shortly to win the 5000 and 10,000 at Melbourne while Zatopek would take a courageous 6th place in the marathon behind his dear friend Alain Mimoun of France. Also a good sequence of Dana Zatopek throwing the javelin. "I just received a photo that I had never seen before and forwarded it to you OU guys. It was taken it 1967 at Mt Sac (I think). Most of the guys from the Big 8 were running for the 49er Track Club. However, a bunch of guys didn’t live in Los Angeles at that time. Some had new jobs or were finishing school. For example, Mickey Miller lived at Stillwater and Dave Crook lived in Lincoln. 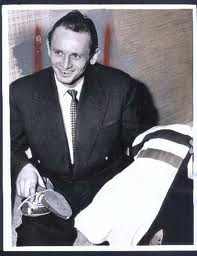 Mel Zahn, who ran the club at that time just used his home address or some other athlete’s address for the out of town guys. The AAU was a real stickler for the residence requirement which basically kept track runners who lived anywhere but California (Striders, Santa Monica Track Club and 49’ers), New York, Houston or Chicago from joining a team and being able to compete." "Anyway, the AAU banned the 49’ers from competing as a team but we were still allowed to compete as individuals. 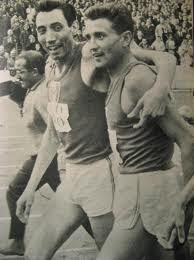 At that time, the 49ers (name came from Long Beach State College 49’ers and the original runners were from Long Beach State) had become the dominant club in track and had just won the Indoor AAU where they used to keep team scores. Anyway, we ended up getting kicked out Of the AAU and Mel Zahn got a lifetime ban for “cheating” on the residence requirements." "I don’t even remember this race but I think that MT Sac had to have prelims in some individual races because all of 49’er relay teams were scratched from the meet. I guess that explains why I’m wearing a USA Team uniform (from 1966 Finland Tour) and David’s wearing OSU even though he graduated in 1965." 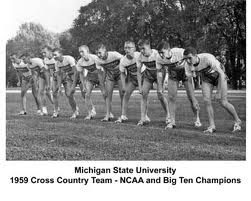 "When that photo was taken, David and I were still the two fastest “varsity” 880 runners in Big 8 history with both us us running 1:47.7 at OSU. Ryun was a freshman when he ran his 1:44.9 at the USTFF Meet. 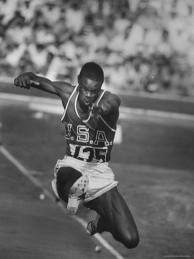 Then he ran 1:46 and change for an 800m later on in 1966 at Los Angeles." "That track looks pretty good, I’m not even making a big hole but a few cinders are flying." I didn't find the beer drinking pic John refers to, but I did find this great shot of Gerry Lindgren that Darryl Taylor posted. 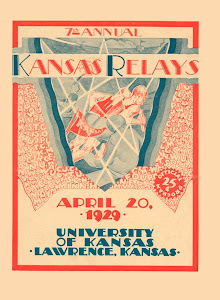 Number 109 is John Lawson of U. of Kansas who is one of our readers. 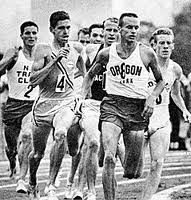 John was NCAA cross country champion in 1965 beating Doug Brown of Montana.. Can someone please identify the Santa Monica runner? 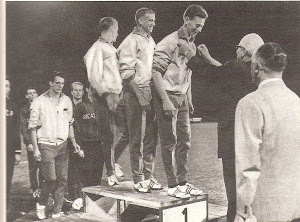 First time posting..great site...I've been looking thru a couple of old 1965 T & F News that I got laying around and I couldn't find anybody on any list that was running for the SMTC at 5 and 10...looks like Greele on Lindgren's shoulder..and also a question..did Cary Weisiger really run a last 300 in 37 or so at the N.Y 1964 semi trials?..the T & F News issue covering the trials has 3.10.9 for Weisiger at 1200/1320 and finish at 3.46.7...35.8 if meters or 37.0 for yards? slow or fast race, that's moving...thanks...Felix Cabrera- Port Washington, N.Y..fan of the sport since seeing Tom O'Hara break the mile record in Chicago and saddened that he gave it up so soon. The photos of the Perry brothers was taken on April 28-1967 during the 9th annual edition of the now venerable MT. SAC RELAYS. There were two heats of the 880 that day and the photo shows the top three finishers of the second heat in their finishing order. Having competed in the first heat, my running log notes that the wind was swirling and gusting throughout the day and T&F News reported gusts of up to 25mph during the running events. In the photo Tom Ferrell is coming off the turn and heading for the finish line where he won in 1:52.8 just ahead of John Perry's 1:53.0 and Dave Perry's 1:53.6. 4th place went to Darnell Mitchell in 1:54.9. In my heat Neville Myton won in 1:52.6 ahead of Dennis Brekow 1:53.0, My third place finish (Darryl Taylor) 1:53.3 and Dan Tague in 4th 1:53.8. This race marked my 9th competition at Mt. SAC, having run every year since the meet's inaugural 1959 opening while representing Excelsior HS, Cerritos College, Long Beach State and the now defunct 49er TC. Comments about the track were correct and when prepared properly the red, crushed brick 440 track was as good as they came back in the day! I sent the photo of Gerry Lindgren to him on his 73rd birthday. This image was captured on January 21st in the old Los Angeles Sports Arena. 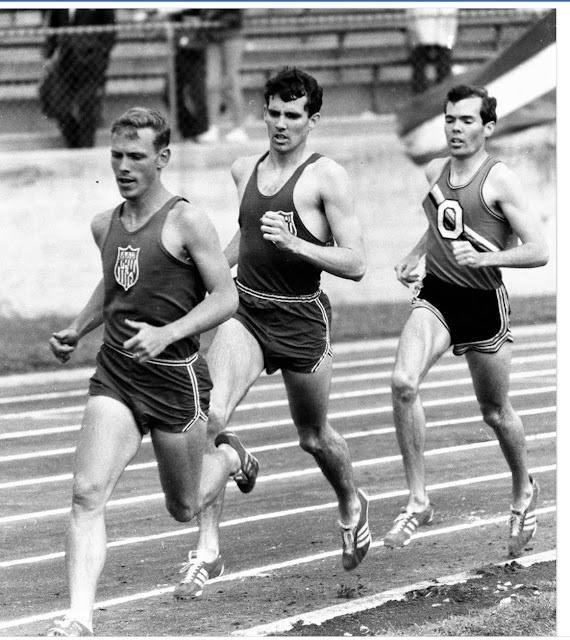 Gerry led throughout this 2-mile competition and trailing closely are Jim Grelle, mostly hidden behind Gerry, Joe Lynch of the Santa Monica AA, and future PCC star John Lawson amd George Young not visible. Grelle kicked past Lindgren for the win in 8:45.0 to Gerry's 8:45.6 and Young's 8:45.8. To paraphrase an old saying, SUCCESS HAS MANY FATHERS. in, promoted and encouraged long distance running in this country. AAU and community enthusiasts. Heath cites, not all, but enough. would have added immensely to the quality and depth of the research. 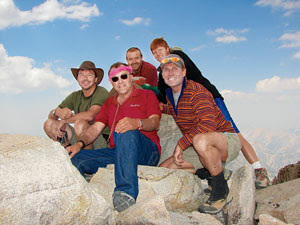 organizers, chroniclers and, almost always, volunteers because of love of the sport. In honoring Browning Ross, especially, for his gifts to American distance running of the Long Distance Log and the RRCA, Heath is spot on. Speaking personally, I read the Long Distance Log avidly and ordered my first pair of Tigers through an ad for Blue Ribbon Sports in the LDL. 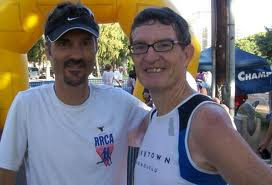 In later years, as editor of the RRCA Footnotes, I was able to witness, first hand, the growth of distance running clubs through the hard work of Ross’s successor presidents and their fellow regional officers. 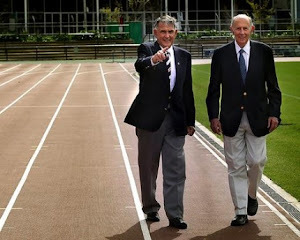 Jack Heath has produced, warts and all, a heartfelt testimonial to one of the men who loved our sport, competed at the highest levels and contributed to its continuing legacy. 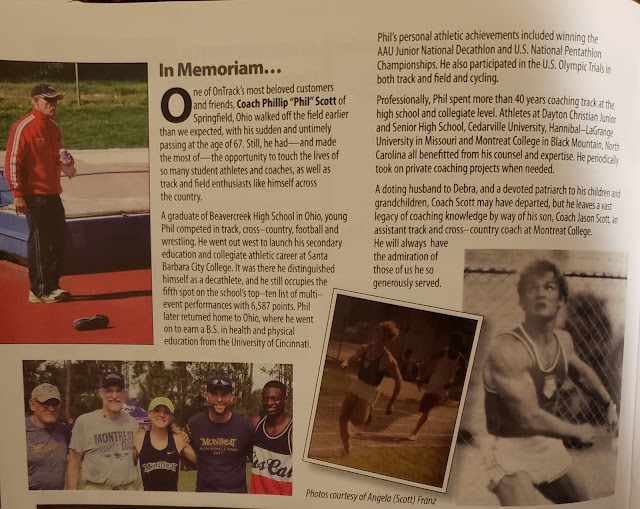 On Thanksgiving weekend we lost a very good friend of track and field, Phil Scott, who we memorialized on our pages shortly after. This week Debbie Scott, Phil's wife sent out a note and photos that were very inspirational and tell more about what kind of guy Phil was to everyone, but also what kind of guy Ron Morris is. 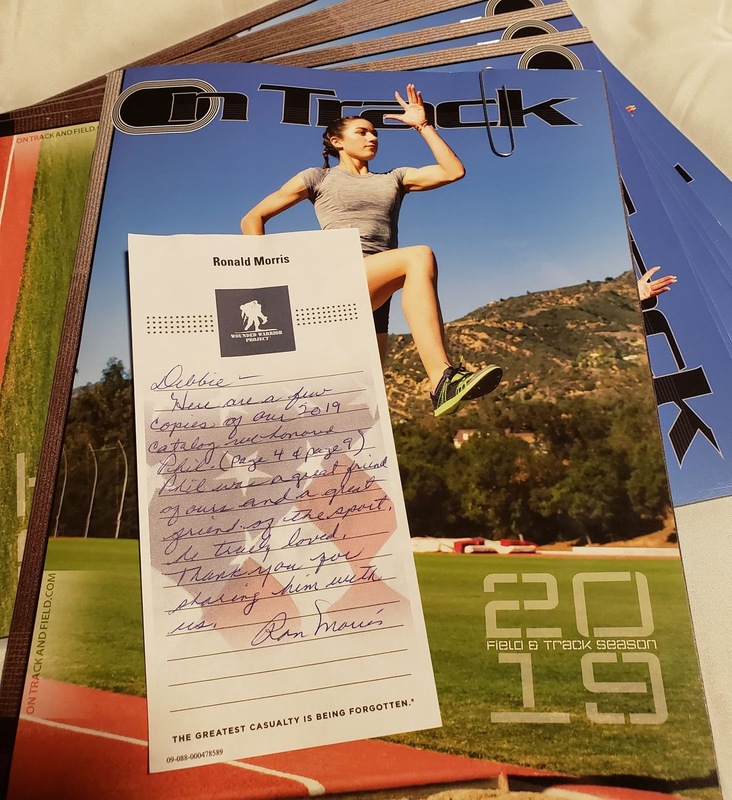 As many of you know, Ron Morris, who was the silver medallist in the polevault at Rome in 1960, owns a track and field supply house in California called On Track. Well, Debbie recently received the new catalogue from Ron with a note telling her how much Phil meant to him. Phil was so important that Ron wrote his own memorial to Phil and featured it in his new catalogue. This may be a first in marketing history, but it also shows what a tight knit community track and field people are with each other. Ron describes some of Phil's traits as well as anyone has done in the last three months. Here is what came to us from Debbie Scott. "Good morning all... I thought you might enjoy seeing something I received. Not everyone gets a tribute written up about them in a yearly catalog. I received several copies of these in the mail the other day. 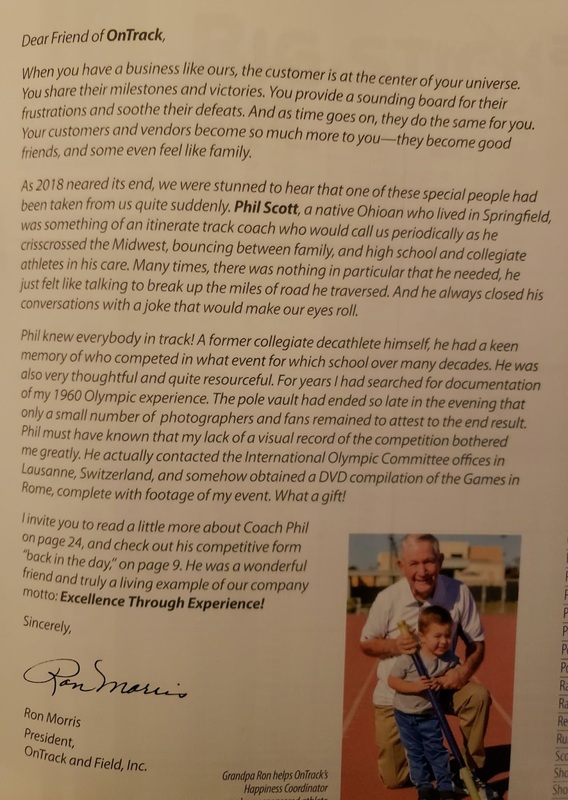 As if having the president of the company dedicate his letter to Phil wasn't enough, they also have a page honoring him, and his picture in the background on another. It gave me very mixed emotions... incredibly proud on one hand, but so sad on the other! Just shows what a truly loved guy Phil Scott was! Feel free to pass this on to anyone you think might be interested." "Hope you all are doing well!" V 9 N. 9 Don Bragg, R.I.P. 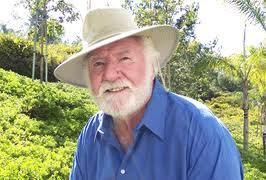 Don Bragg passed away on February 17, 2019 at the age of 83. Born and raised in Carney Point Township in New Jersey, just across the river from Wilmington, Delaware, Don Bragg was a world class vaulter from a very young age, 18 when he ranked sixth in the world. 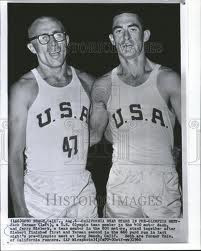 He attended Villanova University and was the second Olympic Gold Medallist to represent the Wildcats after Ron Delaney of Ireland won the 1500 meters in 1956. 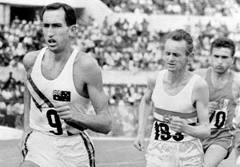 Bragg took home the gold in Rome in 1960. 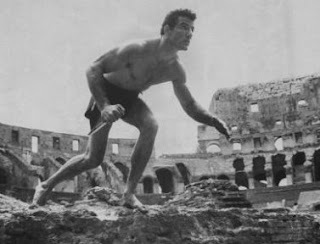 His post victory Tarzan yells earned him the nickname 'Tarzan' and in interviews in those days he often talked about one of his career goals being to play the role of Tarzan in the movies. A film was actually made but never released. 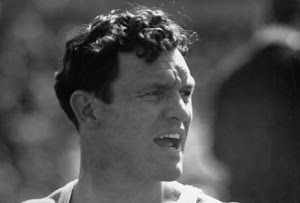 This would have made him the third Olympic champion to play that role after Glenn Morris the 1936 Decathlon Champion and Johnny Weismuller the 1924 and 28 gold medallist in three swimming events and a bronze in waterpolo. It would be an incredible event if someone with movie connections could find and release that film, even to a limited showing. 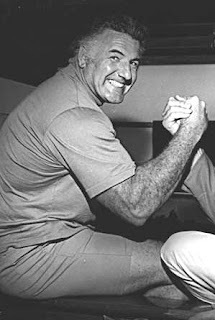 Don Bragg was involved in a multitude of events and had a public friendship with Cassius Clay later Muhammed Ali that developed in Rome during the Olympics where they both were champions. He was AD at Stockton State College in New Jersey. He ran a children's camp in New Jersey for years before moving on to California where he spent his last years. Rome Official Film in Color see PV at 1hr 31 min. Note. Finishing 4th in the PV that year was the Puerto Rican left hander, Rolando Cruz, also of the Villanova Wildcats, making it a rare 1, 4 finish for a US college. 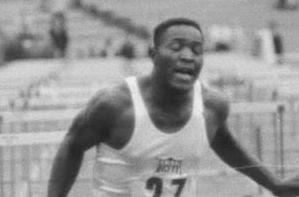 Ron Morris had competed for USC in his college days. 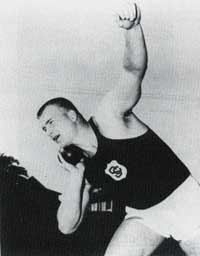 The third place finisher Eeles Landstram had competed for the U. of Michigan. To describe that Rome competition we have to go back in our vaults and dig out Roy Mason's account of that day as derived from the pages of Track and Field News. "An apology is necessary here. The trials were held Monday, the fifth day of the games, and your overworked reporter missed them. 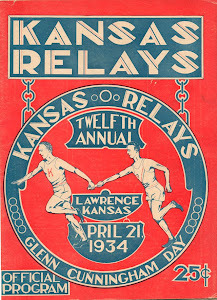 Chief among the causalities were Melbourne silver medalist George Roubanis of Greece and UCLA and the US’s Dave Clark who injured himself warming up and could do only 13-9. Now this is not to say it was a day without drama. Twelve were to qualify for Wednesday’s final. Ron Morris, who had finished a close second to Don Bragg in the US trials, was in trouble. With the bar at 4.40 meters (14-1 1/4), Morris misses three times and is apparently out. Fortunately for him, many others have the same problem. Only ten clear this height, so two more make it on fewer misses. Morris is one. Roubanis, with the same height, is not." "Now let’s fast forward to today. After nearly all the vaulters pass the opening heights (the first was 12-5), the competition begins in earnest at 14-1 1/4. At 14-5 1/4 world record holder Don Bragg misses his first attempt. He appears nervous. 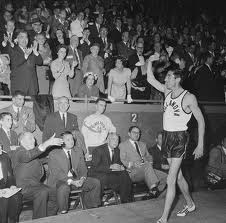 Apparently the vaulters weren’t on the clock, as Hal Bateman writes that Bragg was at the top of the runway for over five minutes before making a successful second attempt, thus producing a chorus of whistles (the equivalent of booing in the US) from the heavily European crowd. He wouldn’t miss again for awhile." "With the bar at 14-11, the field had been pared to seven and Puerto Rico’s Rolando Cruz is the leader by virtue of an unsullied performance. This height eliminates three more vaulters and now only Bragg, Morris, Cruz and Finland’s Eeles Landstrom remain. The next height, 15-1 1/8 (4.60), drops Cruz and Landstrom with the Finn getting the bronze medal on misses." "Reminiscent of the US trials, all we have left are Morris and Bragg with Bragg leading on misses. The US vaulters agree to raise the bar to 4.70 (15-5) instead of the planned 4.65. Bragg is up first. He puts the pressure on Morris by clearing on his first attempt. Now the USC grad will have to not only clear this height, but the next to win. 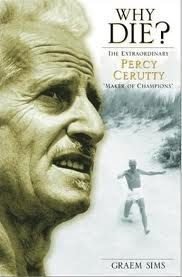 After two bad misses, he comes close, but a miss is a miss and the gold medal goes to Tarzan as he watches." "With the competition decided, Bragg has the bar raised to 4.82 (15-9 3/4) in an effort to break his own world record. He has two close misses and, with darkness and cold settling in, he crushes the bar on his third attempt. The competition is over after six hours and 46 minutes. The Americans have gone 1-2." 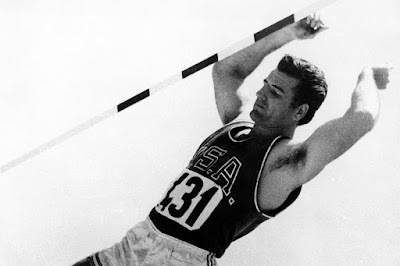 The IAAF is deeply saddened to hear that 1960 Olympic pole vault champion Don Bragg died on Saturday (16) at the age of 83. Born and raised in New Jersey, Bragg was still a teenager when he established himself among the world’s elite. 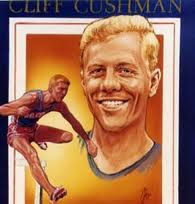 He vaulted 4.42m indoors in 1954 at the age of 18, ending the year as the sixth-best vaulter in the world. 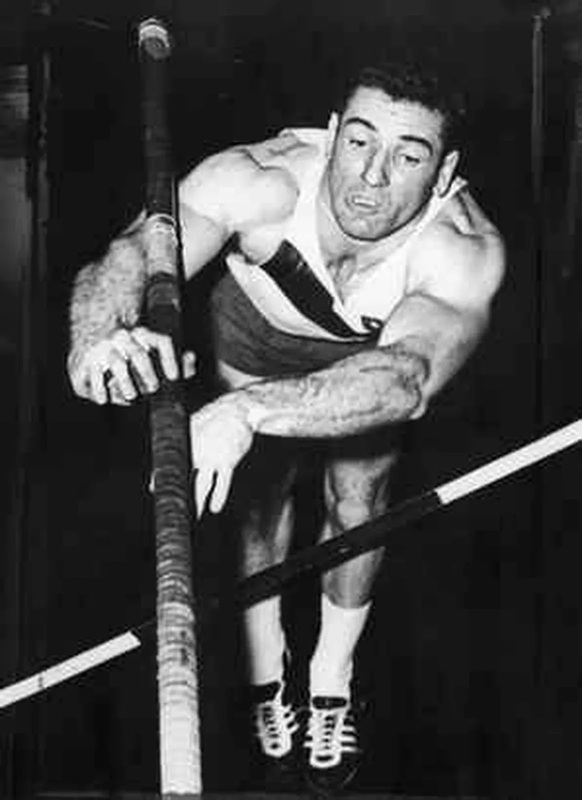 One of the last leading pole vaulters to use a metal pole, Bragg would often perform better indoors than outdoors. 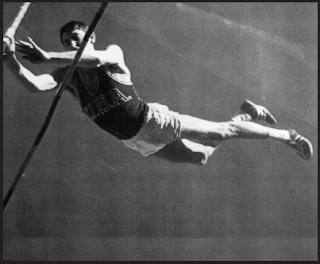 He set a world indoor record of 4.81m in 1959, adding two centimetres to the long-standing record that had been set 16 years earlier by pole vault legend Cornelius Warmerdam. 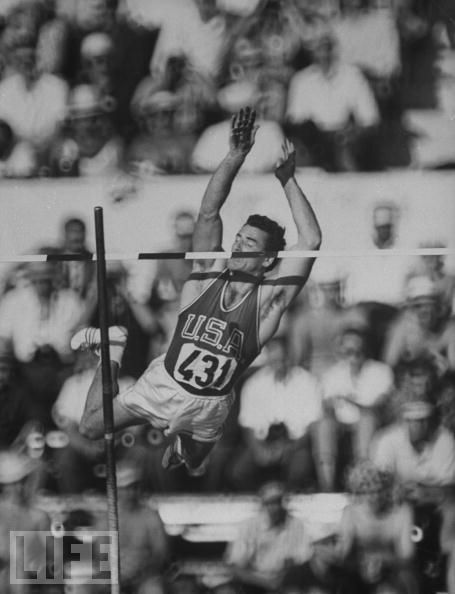 That mark remained the best of Bragg’s career, but he went on to set an outdoor world record of 4.80m to win the 1960 US Trials, making him the favourite for the Olympic Games in Rome later that year. 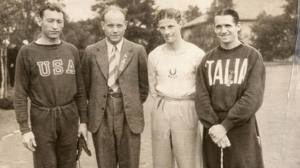 He lived up to expectations in the Italian capital and at the end of a competition that lasted seven hours, Bragg won gold with an Olympic record of 4.70m. 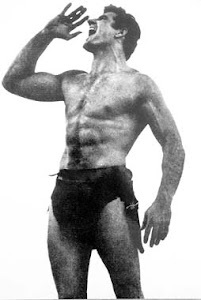 Standing 1.90m (6ft 3in) tall, Bragg earned the nickname ‘Tarzan’ and he would often celebrate his victories with a Tarzan yell from the podium. Long before the discipline became a standard event for women, Bragg’s younger sister Diane learned how to vault and in 1952 cleared 2.59m, which stood as an unofficial world best for 17 years. He is survived by his wife Theresa and four children. George, Out of loyalty to our mutual friend J.D. Martin I have to take issue with the claim that Don Bragg had the highest vault ever on a metal pole. The legend, as told in Norman, Oklahoma, was that J.D. broke Don Bragg’s world record of 15’9 1/4” using a metal pole at a dual meet in Norman. The way I heard the story was that it was a really windy day (you may recall a few of those in Norman). They raised the bar to 15’ 9 3/4’’ but the wind kept blowing the bar off the standards. Finally, to solve the wind problem, they turned one (not both) of the standards around backwards, so the wind could not blow it off. J.D. cleared the bar cleanly, breaking Don Bragg's world record in what was and still is the highest vault ever for a metal pole. But they refused to recognize it as a world record because one of the standards had been turned around. I am copying J.D with this email. If you want to check this out you can contact him directly. He is still very much alive (or was when I saw him in Edmond last October) and can confirm this story. By the way, no disrespect to Don Bragg. As I am sure J.D. would confirm, just surviving the fall from a 15-foot vault in the pits they had in those days was no mean accomplishment. J.D. can you confirm this story below from Walt Mizell? I had forgotten about it. Were you the biggest (height/ weight) to ever clear 15' on metal? "George this is true. 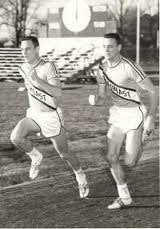 Also In 1961 Don and I competed in my first decathlon and maybe his. We both broke the world record in the decathlon vault jumping 15' 1 1/2. Re Ron Morris. he used the same aluminum alloy pole we used but I think he changed to a fiberglass later in his career ." The Peerless Four is a fictional account/novel about the 1928 Amsterdam Olympics when women were first allowed to compete in track and field on a very limited basis. As we know from earlier reportings in this blog, the opening of events to women was done with great reluctance and trepidation by the men who ruled the Games. Because of these male sentiments, women had already organized a world games for themselves without the approbation of the old boys' clubs that ran the world. 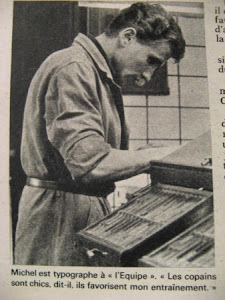 Pierre de Coubertin who is given credit for founding the modern Games was very hesitant, and thought women should only be present to hand out awards. The ancient Greeks banned women entirely, even from spectating, on threat of death. 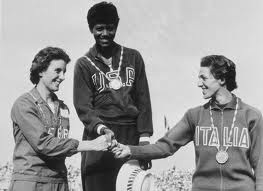 So it was a major concession to tradition when women were allowed to compete in the 100 meters, 800 meters, high jump, discus, and 4x100 meters. Why the 200 and 400 meters were left out is a mystery, and God forbid anything over 800 meters should even be considered. The novel follows the pre-games life of four Canadian women loosely disguised by fictional names, who justly earned their way to the Games and were sent to Amsterdam under close supervision to represent their country. 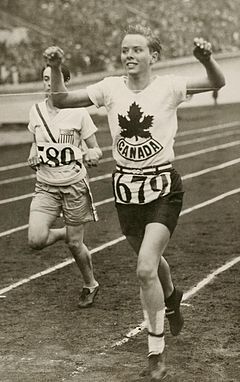 The real women of the fictionally depicted in the novel were Ethel Catherwood, World Record holder in the high jump and a beauty known affectionately as "Saskatchewan Lily" , Bobby Rosenfeld, an immigrant from Odessa in the Ukraine, and later a journalist for the Toronto Globe and Mail, Myrtle Cook, who also would later write a sports column for the Montreal Star. 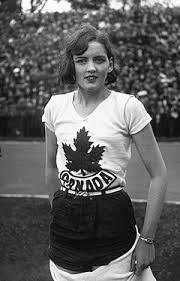 The fourth woman depicted in the book is Jean "Jenny" Thompson who finished fourth in the 800 meters. Victoria Patterson gives life to these young athletes with all their confidence, fears, and flaws as well as life to the people around them, the coaches, chaperone, and a promoter who is there to make a few bucks after the Games only to fall in love with the chaperone. 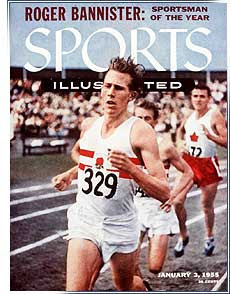 Percy Williams, the Canadian man who won the 100 and 200 at Amsterdam also is fictionally portrayed, including commentary on his later suicide. 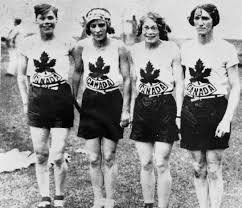 The Canadian official who votes against giving women the right to continue running the 800 after 1928 is treated as the chaperone's husband, a doctor, who stays at home and doesn't witness what he votes to discontinue. The drug of choice is alcohol from the hip flask that is carried by the men and the chaperone and with liberal imbibing at all times of day. It's 1928, remember and women are just getting out from under some of the old societal rules. They are allowed to vote, corsets are out of style, they can smoke, and drink. 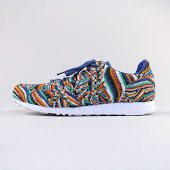 The public can see their ankles in modern fashion apparel. Why shouldn't they be allowed to step on a track in shorts and sleeveless tops and compete like men? Okay but with that exception of nothing longer than the 800 and after these Games, for the next 35 years nothing longer than 200. Gotta save those ovaries and uteri for breeding. My acquaintance, Diane Palmason, a long time world class masters distance runner has the best comment on that thinking. "If women can't run long distance on the excuse of protecting reproductive abilities, why should men be allowed to run the hurdles?" This weekend on CBS Sunday Morning, I was made aware that this form of 'historical novel' is a burgeoning market with the appearance of a book speculating that George Washington had holed up in Harlem during the seize of NYC at the house his former first love, Sally Fairfax, and that she might have been present during that crucial period in US history. 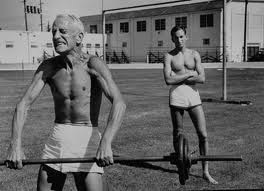 His wife Martha was home tending Mt. Vernon at the time. However scholars of Washington's history made clear that this is highly speculative and cannot to date be proven by and documents proving that the first girlfriend was actually hanging out with George. Women's rights or lack thereof along with sexism are the main themes of the book. I overwhelmingly support the author in those endeavors. At the end of the book there is an index of women's achievements in the early days of sport as well which is greatly appreciated. However the book fails in an attempt to be spot on with details of the sport. 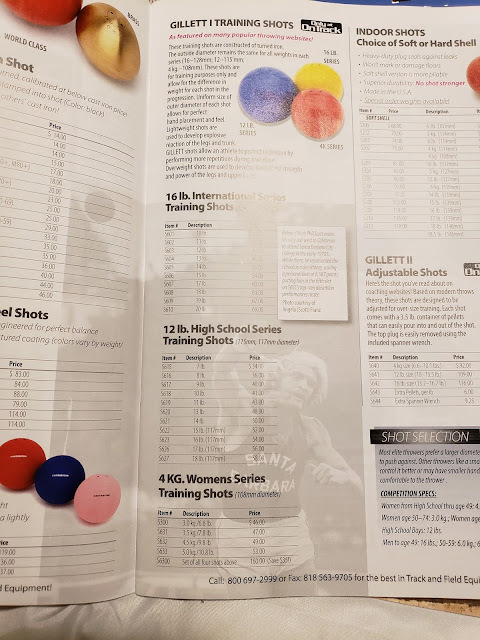 The writer seems to have a superficial knowledge of track and field that could have been acquired in the scanning of a coaching primer. Perhaps being historically accurate was not a goal of this work. 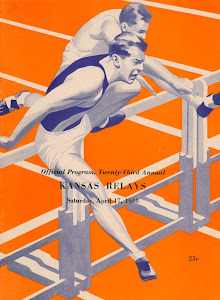 But any track and field fan, who is seduced by the cover of this book showing "Saskatchewan Lily" clearing the high jump bar, will be somewhat deceived by the less than stellar descriptions of the sport. 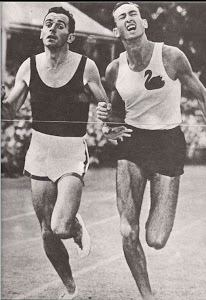 By comparison, Tim Johnston wrote a nonfiction book titled "Otto Peltzer, His Own Man", and he made it as exciting as a novel, with great descriptions of actual races, training, and societal leanings. 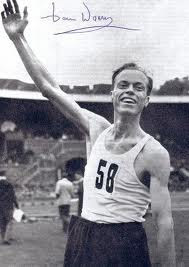 Peltzer, a world class runner and homosexual was as controversial as any athlete in the 1932 and 1936 Games and for thirty years thereafter. 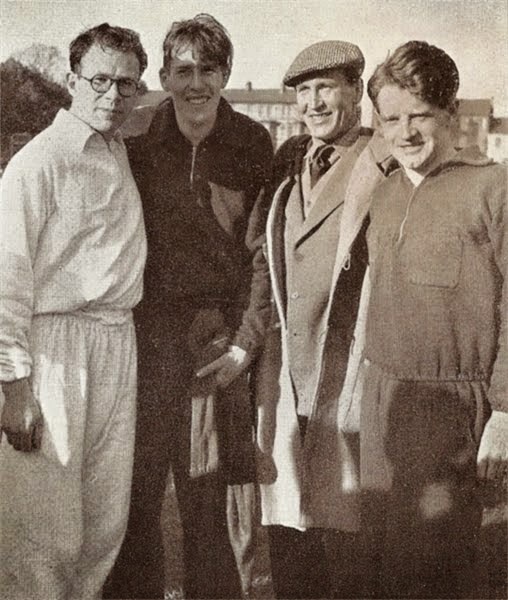 For its lack of historical accuracy, I cannot recommend The Peerless Four to a reader who is a fan or serious and knowledgeable participant in the sport. In reality there were 6 women on that first Canadian team known affectionately as "The Matchless Six". The title cops a plea and calls itself The Peerless Four. No way. No thank you. The author and publisher get away with the standard disclaimer about works of fiction , "Names, characters, places, and incidents either are products of the author's imagination or are used ficticiously. Any resemblance to actual events or locales or persons, living or dead, is entirely coincidental." Okay you're cleared, but it is a disappointment to this reader. The cover has a nice picture of Ethel Catherwood clearing the bar in Amsterdam, but the newspaper clipping under it a fiction, and I should have picked up on that. 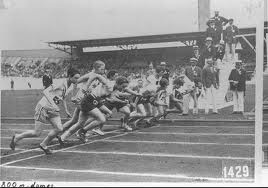 Among the journalists who lambasted the 'collapsing women' after the 800 meters in which the first four broke the world record was William L. Shirer who would later write the popular Rise and Fall of the Third Reich and John R. Tunis who wrote a bevy of boys books (fictional). I guess their 'journalistic work' was somewhat fictional as well. In Amsterdam, Paavo Nurmi was flat on his back after one of his races, but that was okay. He was a man. Probably some old boy collusion between the organizers and the journalists. Here are links to brief but real bios of each of the six Canadian women on that team from Sports Reference. "The Matchless Six" by Ron Hotchkiss is also available.